Blog : Pumpkin Pie Spice Is For More Than Just Pies! Pumpkin Pie Spice Is For More Than Just Pies! November is here and you know what that means- pumpkin pie spice everything! Traditionally a blend of cinnamon, nutmeg, ginger, allspice and sometimes cloves, this once outmoded spice blend has exploded in popularity over the last couple years. It's a great beginner spice blend because it adds sweet and spiced taste without adding heat. Despite its name, pumpkin pie spice can add fall flavor to just about anything, not just pumpkin. Check out five of my favorite things to do with pumpkin pie spice blend that don't include baking pie. 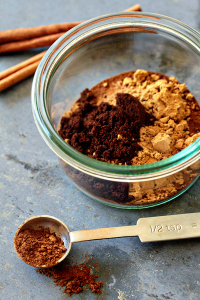 Coffee: Sprinkle a dash or two into your ground coffee before brewing for a spiced treat. Add a little warm milk of your choice and you've got an all-natural pumpkin spice latte! Vegetables: My favorite fall dish is a pumpkin pie spiced Brussels sprout gratin, but you can add an autumnal flare to any roasted vegetable with a dusting of pumpkin pie spice. The combination of roasting and the spice brings out the natural sweetness in root vegetables and squashes. Try beets, carrots, potatoes, turnips, cauliflower, parsnips, and yes, even pumpkin; toss with some olive oil, salt, and spice before roasting. Baked apples: Pumpkin pie spice tastes equally delicious on apple dishes as it does on pumpkin dishes. Mix the spice with some brown sugar and spoon onto cut apples before baking and you have a delicious dessert. Leave out the brown sugar and you have a sweet and spicy topping for pork! Even easier, use in place of plain cinnamon to dress up unsweetened apple sauce. Popcorn: Now that it's dark and chilly outside, staying in to watch a movie with some warm popcorn sounds better than ever. Melt a small amount of butter and stir in some pumpkin pie. Drizzle on fresh, plain popcorn with a pinch of salt and your treat is ready. If you're not into butter, a little olive oil would also do the trick. If you're not into oil at all, just sprinkle the spice right onto the popcorn! Lentils: Here's what I do- heat some olive oil in a pot and saut a chopped onion and 1-2 cloves garlic. Sprinkle in pumpkin pie spice and add about 1 cup rinsed lentils; stir to coat each lentil with spiced oil. Carefully pour in about 2 cups of vegetable broth (or chicken broth) and bring to a boil. Toss in a small handful of raisins and cook until lentils are soft. Salt to taste. Very easy, very yummy. FYI: If you don't feel like shelling out the money or pantry space for another jar of spices, make your own blend with 2 Tbsp. ground cinnamon, 2 tsp. ground ginger, 1 tsp. ground nutmeg, 1 tsp. ground allspice. For a more modern twist, add 1 tsp. of ground cardamom or 1/2 tsp. ground cloves.